Chain - With color 1 ch260 (RS). Fasten off. Skip 70ch, rejoin color 1 with a sl st to next ch, work sl st in each of next 119ch. Fasten off leaving 70ch un-worked. Weave in all loose ends of yarn. Motif - (Made in continuous rounds with turning) With color 2 make magic circle, ch1, 12sc in circle, pull loose end of yarn to close and sl st to first sc on beginning of round. Fasten off. 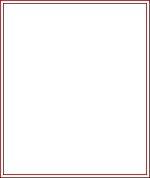 Round 2 - Join in color 1 to first sc, ch1, * work (1sc, 1hdc, 3dc, 1hdc, 1sc) in next sc, skip 1sc, * rpt from * to * to last sc, skip last sc, sl st to first sc, ch6, sl st to last sc you just skipped. Fasten off. Finishing - Weave in any loose ends of yarn, attach pearl button to centre of motif, thread Chain through 6ch loop on motif and tie at neck. 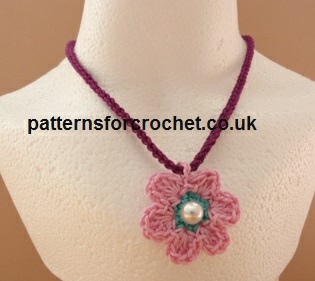 Hope you enjoy this free crochet pattern flower necklace.